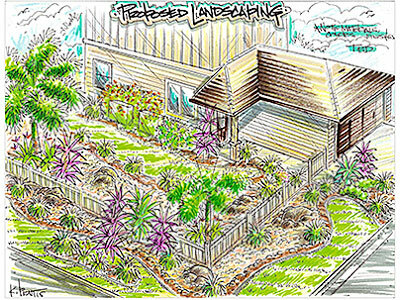 We have a dedicated team of designers who carefully map out landscape plans based on your preferences and needs. Our plans are not typical ones, however, but conscientiously drawn and well-thought of. Our landscape designs are not just meant to bring out your property's beauty, but also to turn it into a place that your family, friends, guests, or clients can safely and peacefully stay at. Like our clients, what we are after is to create a landscape that is beautiful in every way. Our belief that the outdoor setting must not only be utilitarian, but also aesthetically superior has led us to always strive for stunning landscape designs. Specifically, we can create custom landscape themes such as English style or Japanese inspired. For those who love a tropical setting, we can come up with a landscape design plan that is suggestive of an island paradise. In all our landscape design projects, we make sure that we achieve critical elements of balance and harmony. We see to it that one landscape feature does not overpower all the others, and we strive to present all the landscape elements in a harmonious way. Only when we have incorporated balance and harmony in our design proposal do we feel confident and satisfied with our work. Hardscape. 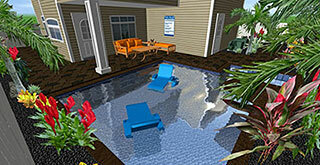 We can add walkways, driveways, pool decks, and similar hardscape structures to the plan. These utilitarian elements can also form part of the overall aesthetic merit of the landscape. Softscape. A landscape setting will not be complete without shrubs, trees, turf, perennials, and annuals. These softscape elements offer a delicate touch to any outdoor space. Water features. We add ponds, waterfalls, pools, and other water features to the design plan so clients can feel relaxed and refreshed every time they head out to their outdoor area. Outdoor living. Patios, gazebos, outdoor kitchens, and the like will surely make any landscape inviting and ideal for unwinding after a tiring day. Fire features. We include fire pits, fire bowls, and fireplaces so property owners can feel warm and cozy outdoors during chilly days and nights. Call us today at (808) 726-9495 for more details on our landscape design services.